In the present paper a transient three-dimensional thermo-mechanical model for concrete is presented. For given boundary conditions, temperature distribution is calculated by employing a three-dimensional transient thermal finite element analysis. Thermal properties of concrete are assumed to be constant and independent of the stress-strain distribution. In the thermo-mechanical model for concrete the total strain tensor is decomposed into pure mechanical strain, free thermal strain and load induced thermal strain. The mechanical strain is calculated by using temperature dependent microplane model for concrete (Ožbolt et al., 2001). 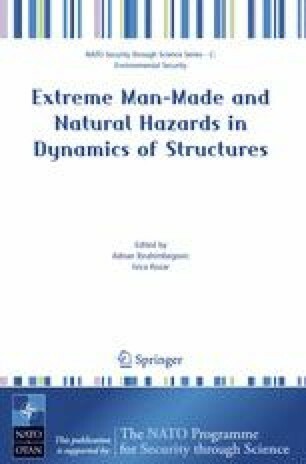 The dependency of the macroscopic concrete properties (Young’s modulus, tensile and compressive strengths and fracture energy) on temperature is based on the available experimental database. The stress independent free thermal strain is calculated according to the proposal of Nielsen et al. (2001). The load induced thermal strain is obtained by employing the bi-parabolic model, which was recently proposed by Nielsen et al. (2004). It is assumed that the total load induced thermal strain is irrecoverable, i.e. creep component is neglected. The model is implemented into a three-dimensional FE code. The performance of headed stud anchors exposed to fire was studied. Three-dimensional transient thermal FE analysis was carried out for three embedment depths and for four thermal loading histories. The results of the analysis show that the resistance of anchors can be significantly reduced if they are exposed to fire. The largest reduction of the load capacity was obtained for anchors with relatively small embedment depths. The numerical results agree well with the available experimental evidence.